For the 2012MY, the Volkswagen Touareg gets a new 3.0L V6 TDI® Clean Diesel offers 28 highway mpg and 728-mile range and is exceptionally quite and delivers strong mid-range response for fast, safe passing, and relaxed high-speed cruising. The VR6 and TDI Clean Diesel lines are now available with a new Touareg Sport with Navigation model that adds a sophisticated RNS 850 navigation system with an eight-inch color touchscreen, 60GB hard drive and Park Distance Control. Herndon, VA –There’s a new standard in sport-utility luxury. 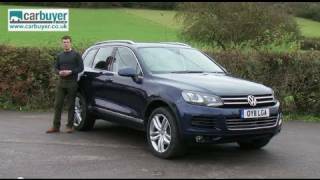 The 2012 Volkswagen Touareg shows the road ahead with advanced, fuel-saving technologies, and a new premium driving experience. New from the ground up for the 2011 model year, this second-generation Touareg is bigger yet as much as 350 pounds lighter; more spacious yet lower to the ground; more luxurious and better-equipped yet has a starting MSRP of just $42,975—considerably less than many mid-size SUV rivals. To truly show the road ahead, the 2012 Touareg model range features the world’s first supercharged gasoline hybrid, packing the punch of a V8 with the fuel efficiency of a V6—and, at speeds up to 30 mph, the zero emissions of an electric car. And while other automakers decide whether to offer diesel powertrains for their SUVs, the 2012 Touareg TDI® Clean Diesel is already on the highway, averaging 28 mpg on the highway and covering over 700 miles on each tank of ultra-low-sulfur diesel. As the Touareg was re-designed and re-engineered for the 2011 model year, changes for 2012 are limited to new equipment packages and additional features. The VR6 and TDI Clean Diesel lines are now available with a new Touareg Sport with Navigation model that adds a sophisticated RNS 850 navigation system with an eight-inch color touchscreen, 60GB hard drive and Park Distance Control. 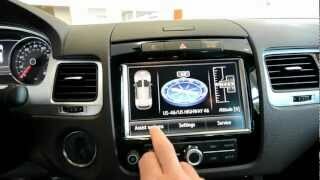 For 2012, the VR6 and TDI Clean Diesel Sport gain a touchscreen radio with in-dash six-CD changer. The Touareg has always had an imposing curbside presence thanks to its sleek profile and wide, dynamic stance. This appearance has been reinforced by the second-generation model, which is even lower and wider. It’s longer too, adding an extra 1.6 inches, and features an extended wheelbase—by 1.5 inches—to provide more rear-seat legroom. In reshaping the Touareg, Volkswagen’s design team set out to give the new SUV a crisper, sleeker, more aerodynamic look based on the new Volkswagen Design DNA. This includes the horizontal front-end theme you see in the latest Golf and Jetta, and that ended up in the Eos and all-new Passat, as well the Touareg’s smaller sibling, the 2012 Tiguan. Key design elements, which have also inspired the look of the Tiguan, include a narrower grille, featuring twin chrome-faced strips that connect seamlessly to new trapezoidal headlight housings. These feature a dramatic U-shaped ring of bright-white LED daytime running lights along with Bi-Xenon high intensity gas-discharged headlamps. The horizontal theme continues in the sleeker, body-colored front bumper with its large, U-shaped, chrome-ringed air intake and large side intakes. The new hood features a bold raised section that runs from the grille back to the windscreen A-pillars, adding to the strong, muscular, front-end face. At the back, the new Touareg is defined with pronounced curves around the hatch area, new ‘L-Design’ taillights, and a blacked-out lower rear spoiler with a set of stunning, triangular-shaped chrome exhaust tips. Thanks to the Touareg’s lowered body height, short overhangs, and clean, simple surfaces, the car doesn’t appear excessively large. Contributing to the seemingly smaller size are features like a broad, full-length chrome side-strip at the base of the doors, black-painted side window frames, and large wheels. Ignore the rugged, mud-plugging SUV image; the 2012 Touareg is all about luxury. Witness the optional ‘Vienna’ leather in Black Anthracite, Cornsilk Beige, or brand-new Saddle Brown. Or the elegant Walnut wood accents. And the available 620-watt, 10-speaker sound system from Danish hi-fi specialists Dynaudio®. It has never been so comfortable conquering the wilderness or maneuvering through busy city streets. Stretching the wheelbase has also made it easier to stretch out in the back. There’s an extra 2.7 inches of knee room: with a 40/60-split rear seat that can slide forward or back by 6.3 inches, as well as recline, there’s no better vehicle for relaxing on a road trip. In addition to being able to carry five in comfort, the 2012 Touareg can also carry all of their luggage. Press a button on the elegant remote key fob to release the power-lifting tailgate and there is space behind the seats to swallow more than 32 cubic feet of cargo. Need more space? The seatback is split 40/20/40 with each section folding to offer an array of load-carrying possibilities. And with all sections folded, the Touareg can squeeze-in an impressive 64 cubic feet of luggage. To let the sun shine in, the 2012 Touareg offers an available expansive panoramic glass sunroof. Measuring 57 inches long and 39 inches wide, it’s a full 350 percent larger than the sunroof in the previous model. It is so big that this tilt/slide roof occupies almost the entire roof area above the occupants, thus conveying a unique feeling of open space. To cut all light, the optional panoramic sunroof is equipped with a power sunshade. The panoramic sunroof is standard in the Lux and Executive models, as well as the Touareg Hybrid. For the driver, the 2012 Touareg offers the finest of workplaces. A new seat design offers more side and under-thigh support along with up to 12-way power adjustment. And, for more interior comfort headroom in the front (and rear) has been improved. Volkswagen instruments set the standard for simplicity and clarity, and the Touareg’s oversized speedometer and tachometer are no exception: Crisp, easy-to-read numbers, red needles, no clutter. And mounted between the dials is a seven-inch color, high-resolution display providing the driver with the latest vehicle status information, including fuel range, turn-by-turn navigation directions, information from the drive system in the Hybrid model, and much more. Mounted in the center of the fascia is either Volkswagen’s RCD 550 sound system or premium RNS 850 touchscreen navigation system. It features a crystal-clear eight-inch screen, with a DVD/CD player that has MP3 playback capabilities and Satellite/FM/AM stereo. A cool feature of the unit’s navigation system is that it can display maps and directions in a high-definition 3D view. To store music, the system features a 60GB hard drive with 18GB of space available to upload media. Located in the glovebox is access for an iPod® device or auxiliary input, SD cards and a DVD drive. For true audiophiles, or those who like to play their music just plain loud, there’s an available 620-watt Dynaudio® sound system with 10 premium speakers (four tweeters, two midrange, four woofers) and DSP (Digital Signal Processing) technology. It rocks. And the 2012 Touareg’s cabin delivers interior quality at its finest. From its soft-touch, low-gloss plastics, to its ‘Vienna’ leather, to its Walnut veneers and brushed metal trim, it delivers a true premium experience. The 2012 Touareg offers a choice of three highly-advanced powertrains that each offer unique driving characteristics. The 3.6-liter V6 FSI® gasoline engine is one of the most powerful that Volkswagen builds. With double overhead camshafts, four valves per cylinder, variable valve timing and direct fuel injection, it produces 280 horsepower and 265 lb-ft of torque. Exceptionally quiet and refined, it delivers impressive off-the-line acceleration, strong mid-range response for fast, safe passing, and relaxed high-speed cruising. Coupled with the eight-speed automatic transmission that’s standard on all 2012 Touareg models, the Touareg V6 FSI has seen real gains in fuel economy. The EPA-estimated 23 mpg highway/16 mpg city represents a combined 19 per cent improvement over the previous model. The 3.0-liter turbocharged V6 engine powering the Touareg TDI® Clean Diesel is acknowledged as one of the world’s great engines. It’s the engine that powered the Touareg TDI of Rainer Zietlow and his team on the recent TDI-Panamericana Challenge, setting a new world record of 11 days, 17 hours and 22 minutes for the grueling 16,000-mile drive from Argentina to Alaska. This six-cylinder turbocharged powerhouse produces 225 horsepower and a mighty 406 lb-ft of torque from just 1750 rpm. It also delivers an EPA-estimated 28 mpg on the highway and 19 mpg in city driving. That means up to 728 miles of driving on one tank of ultra-low-sulfur clean diesel. To achieve its 50-state-legal emissions qualification, a deNOx catalytic converter, augmented by a special injection system that sprays AdBlue into the exhaust, helps reduce NOx emissions by up to 90 per cent. This lets the engine meet the Tier 2, Bin 5/ULEV II standards imposed across all 50 U.S. states. Like the Touareg V6, the TDI Clean Diesel comes standard with an eight-speed automatic transmission. A first in the SUV market, this new transmission configures seventh and eighth gears as fuel-efficient overdrives: top gear reduces engine rpms by 33 percent over sixth gear. (The car’s maximum speed is reached in sixth gear.) In addition to offering significant fuel economy benefits, it makes for quieter, more relaxed highway cruising. The transmission also features Tiptronic® manual control along with Sport mode, and a Dynamic Shift Program (DSP) that adapts to the driver’s individual style and adjusts the shift points accordingly. 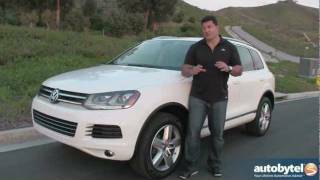 As Volkswagen’s first production hybrid electric vehicle, the all-new 2012 Touareg Hybrid pairs a 3.0-liter 333-horsepower supercharged, direct-injection V6 gasoline engine with a 47-horsepower electric motor. The electric motor gets its energy from a nickel metal-hydride battery pack fitted beneath the luggage compartment. The 288-volt pack consists of 240 individual cells and offers an energy density of 1.7kWh. Both systems are capable of running independently, or together. When combined they produce a total of 380 horsepower and 428 lb-ft of torque, thus offering drivers the power of a V8 with the better fuel economy than a V6. One of the real benefits of the hybrid powertrain is its astonishing off-the-line acceleration when gasoline and electric power combine to deliver that 428 lb-ft of torque. If hard acceleration isn’t called for, the Touareg Hybrid can cruise up to 30 mph on pure, zero-emission electric power. The Touareg Hybrid also uses a host of innovative new technologies to help it achieve its EPA-estimated 24 mpg during highway driving. For example, when the driver releases the gas pedal at cruising speeds, the engine will shut off and a special clutch disengages the transmission from the engine, allowing the car to ‘coast’ along emission-free. Regenerative braking also allows the electric motor to recover kinetic energy during coasting and braking, to help recharge the battery pack. And, in another first for the Touareg Hybrid, there’s a standard Stop-Start system, which automatically stops the engine during idling while, for instance, waiting at a red light. When the brake is released, the engine re-starts. The design changes for the Touareg included an increased use of aluminum. This contributed to the impressive 300-pound-plus weight reduction—366 pounds for the Touareg 3.6 V6 FSI and 330 pounds with the Touareg TDI Clean Diesel—compared to the previous versions. Shaving this amount of weight has had the benefit of making the new Touareg feel more agile and responsive, delivering a more precise driving experience. 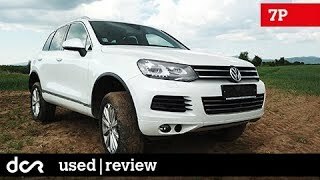 For this second-generation Touareg, Volkswagen engineers further developed its all-independent suspension. The basic layout, however, remains the same, with control arms at the front and rear. To save weight, the upper links are made from lightweight aluminum with the robust lower links made from steel. Long-travel steel coil springs are used at each wheel. 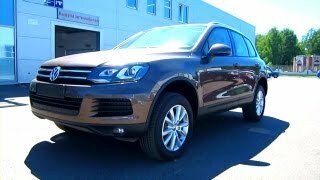 4Motion® permanent all-wheel drive is standard on all 2012 Touareg trim lines. The system features a rear limited-slip Torsen® differential that splits the available torque 40 per cent front and 60 per cent rear for balanced on- and off-road driving. Variable-ratio power steering gives a precise, responsive feel to the Touareg’s helm, requiring 2.6 turns to go from lock to lock. Wheel choices are dependent on each individual Touareg model. The Sport comes standard with the 10-spoke 18-inch Tacora wheel fitted with 255/55 R18 all-season tires. The Lux and Hybrid feature 19-inch, five-spoke Everest rims with 265/50 R19 tires. The Executive model has 20-inch Pikes Peak wheels with 275/45 R20 tires. The 2012 Touareg offers an impressive number of standard active and passive safety features to help keep driver and passengers safe. Passive safety features include six airbags, including Side Curtain Protection® head airbags for the front and rear outboard occupants, and front and thorax units for the driver and front passenger. The line-up of active systems include an advanced Rollover Sensor System that monitors the vehicle’s turning angle and speed, which can help detect a possible rollover situation. If it determines a rollover hazard is present, it deploys the side curtain airbags to help reduce the risk of injury. There’s also a next-generation Tire Pressure Monitoring System (TPMS), Brake Disc Wiping to help keep the pads dry so as to optimize braking when it’s raining, and Volkswagen’s advanced Electronic Stability Control (ESC) system. The Touareg features Volkswagen’s Intelligent Crash Response System that automatically unlocks all the doors, disables the fuel pump, and turns on the hazard lights in the event of certain types of collision. Finally there’s the peace of mind of Volkswagen’s no-charge Carefree Maintenance Program. All scheduled maintenance is covered for the length of the New Car Limited Warranty—three years, or 36,000 miles, whichever comes first. The 2012 Touareg line-up is kept simple by offering customers a choice of four trim levels—Sport, Sport with Navigation, Lux, and Executive—with either 3.6 VR6 gasoline or 3.0 TDI Clean Diesel power. The Touareg Hybrid is a stand-alone model.